In this tutorial, aimed at both Pro Tools and Pro Tools First users, I will discuss a sometimes confusing term, the Bus. It is an essential element in the architecture of a mixer. One obstacle is that books or DAWs often use different terminology or have a different understanding what they consider a bus, and Pro Tools is no exception. This article will hopefully provide some clarification to get a better understanding about that topic. Pro Tools, like pretty much every DAW on the market, is a virtual replica of two things, a tape machine and a mixing console combined in a software app. The tape machine is represented by the Edit Window, where you record and edit your material. The virtual mixing console is represented by the Mix Window, although in Pro Tools, you can do a lot of that in the Edit Window too. In this tutorial, I discuss the mixer part to demonstrate its signal flow with a focus on the terminology. If you had the advantage to learn sound engineering on a traditional mixing console, then you might have a much better understanding about the general signal flow in a mixer. In the "real" world, the actual signal flow often has to be established by plugging patch cords into patch bays to send (route) audio signals from A to B to C, etc. You will get a better visualization of how the signal flows in and out of the mixer or between channel strips inside the mixer. In the "virtual" world of a DAW like Pro Tools, everything is more abstract, despite the nice graphical user interface elements that make it look like a hardware mixing console. Here, the signal flow is established with commands, menus, and menu items, and you have to imagine (or know) what happens to the signal when you choose menu item a, b, or c. When the labels for those menu items (the used terminology) are different from what you expect, or used to from other DAWs, then you could run into problems or confusion. Let's start with the basic signal flow of an Audio Track in Pro Tools and see what components are involved. This is basically the same architecture that was used in early analog mixing consoles and not much has changed with that concept since then. Input Selector ➊: At the beginning of the signal flow of a channel strip you have to select the source signal ➋ you want to feed into the channel strip. Track Lane ➌: Please keep in mind that on an Audio Track, the Audio Clips on its Track Lane are also considered an audio input during playback. Inserts ➍: This is technically the first "processing" stage along your channel strip's signal flow. The term "insert" comes from analog mixing consoles where you have to use a patch cord to "plug in" outboard effect units to "insert" them into the signal flow. Volume ➎: This is the traditional Volume Fader that sets the level of the signal that is sent out of the channel strip. Mute ➏: The Mute Button lets you silence the Track by cutting the signal flow, so it won't reach the output. Pan ➐: The Pan Knob(s) lets you control how much of the signal you want to send to the left or the right output channel. Output Selector ➑: This is the final stage of the signal flow on a channel strip, where you choose the destination you want to send the signal to. Sends Selector ➒: The Send is the component on a channel strip, that lets you send (route) the signal to additional outputs. Instead of sending it out at the end of the signal flow ➑, you "tab" the signal from right before the Volume Fader ➎ (pre) of after the Volume Fader and Mute ➏ (post). Pro Tools has 10 individual Sends, but Pro Tools | First is limited to only 4. Now lets's look at the signal flow diagram again and concentrate on the following three components, the Input Selector ➊, the Output Selector ➋ and the Sends Selector ➌. They control the incoming source signal (what goes in), and the outgoing destination (what comes out) of the channel strip. Next to it is as screenshot of the Pro Tools Audio Channel Strip, showing those related components. These controls are so-called "Selectors", a common user interface element in Pro Tools. It is a button or an area (very often with a little downward arrow), that opens a popup menu when you click on it to make a selection from the available menu items. Input Selector: When you click on the Input Selector ➍, a popup menu ➎ opens with two options "interface" and "bus". They will open submenus (indicated by that tiny arrow next to it) that list all the sources that are available to feed into this channel strip. Output Selector: Pay attention to the Output Selector ➏, because you have to make sure to click on the button and not the little fader iconon that button. A popup menu ➐ opens with two menu items, "output" and "bus". Send Selector: The Send Selector ➑ also requires attention, because now you have to make sure to click on the little arrow iconand not the button itself to open the popup menu ➒. The two menu options are the same as for the Output Selector, "output" and "bus", which open submenus to select the Send Path, the destination for that specific send. There term "Bus" might be the most confusing term when it comes to signal flow. Like so many times with terminology, the same term could often mean different things, or even worse, it could mean different things to different people. To shed some light on the technical term "bus", I will first explain the signal flow of a standard mixing console using generic terms to demonstrate the technical concept. After that, I show what terms Pro Tools uses for the various components. In the most generic way, a bus is like a water pipe or a piece of wire that "transports" an audio signal. Like a water pipe, it has a source(s) where you feed into the pipe and a destination(s) where the water is flowing to(signal is routed to). Most mixing consoles are based on the following architecture of three types of busses. 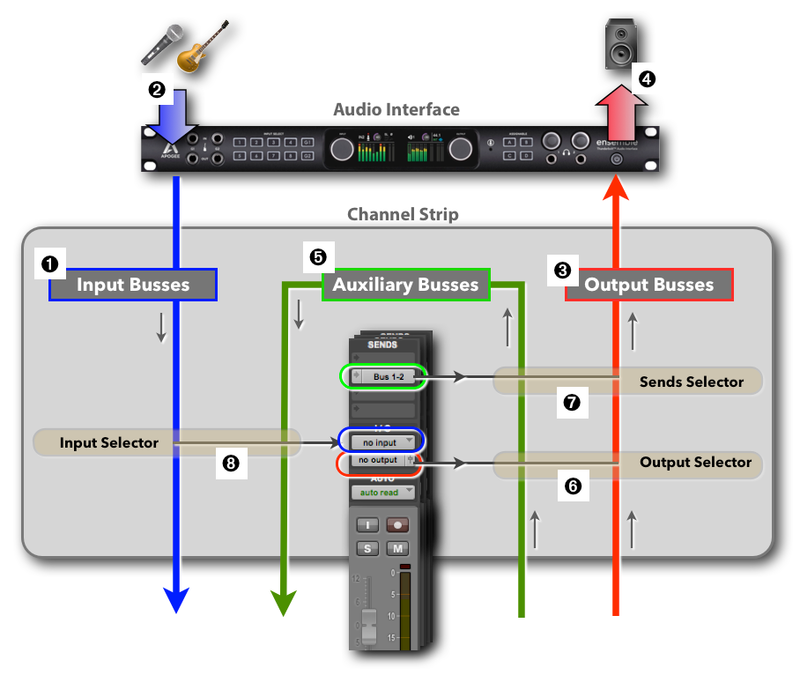 Input Busses: The Input Busses ➊ represent the physical inputs of your connected audio interface ➋ where you connect your mics or your other audio sources. That means, the more inputs you have on your audio interface (so-called "input channels"), the more available Input Busses you will have available in Pro Tools to choose from the Input Selector. Output Busses: The Output Busses ➌ represent the physical outputs of your connected audio interface ➍ where usually your speakers are connected to. Again, the number of outputs ("output channels") on your connected audio interface determines the number of available Output Busses in Pro Tools. Auxiliary Busses: The Auxiliary Busses ➎ don't represent any external hardware device. The word "auxiliary" means "providing supplementary or additional help and support", and that's what these busses are for, all-purpose busses that help you route audio signals internally through the mixer for various purposes, for example, audio groups or sub-mixing. Pro Tools' mixer has unlimited Auxiliary Busses, but Pro Tools | First is limited to 24. Please note that the three selectors for the input routing and output routing on a channel strip are not related to the three types of busses. The selectors just determine which type of the busses you can choose from. Output Selector: The Output Selector ➏ lets you choose to send the signal to any of the Output Busses ➌ (which means the audio interface) or send it to any of the Auxiliary Busses ➎ to route it, for example, to another channel strip inside the Pro Tools Mixer. Sends Selector: The Sends Selector ➐ provides the same options. Send it to any of the Output Busses ➌ and/or to the internal Auxiliary Busses ➎. Input Busses ➊ = "interface": Pro Tools uses the term "interface" for the Input Busses, representing the available input channels of the connected audio interface. The popup menu for the Input Selector ➍ (also called "Audio Input Path Selector) lists that menu item "interface". Personally, I find that term confusing, because the Output Busses also represent the interface. Output Busses ➋ = "output": Pro Tools uses the term "output" for the Output Busses, representing the available output channels of the connected audio interface. 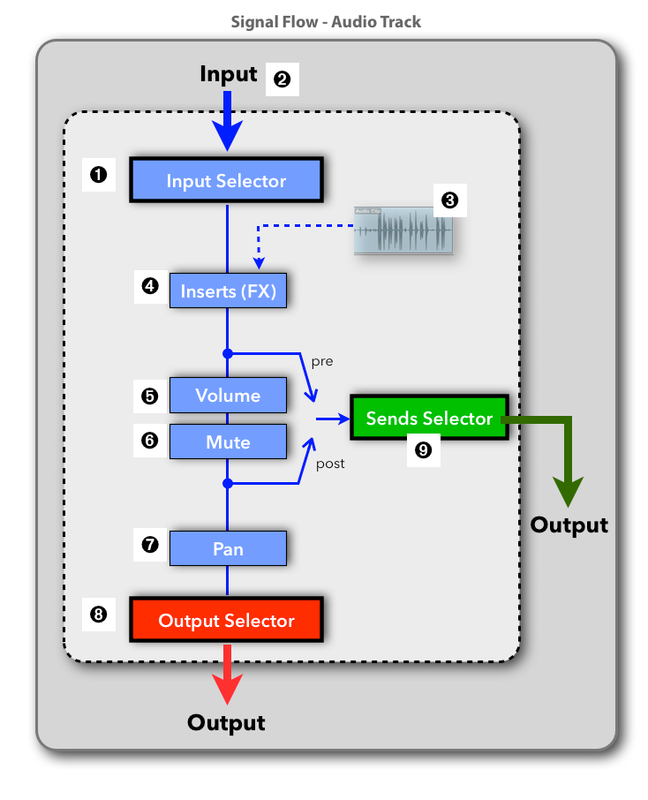 The popup menu for the Output Selector ➎ (also called "Audio Output Path Selector) and the popup menu for the Sends Selector ➏ list that menu item "output". Please note that your hard drive ➐ can also be an output destination when you bounce your mix. Auxiliary Busses ➌ = "bus": Pro Tools uses the term "bus" for the Auxiliary Busses representing the available internal busses. Pro Tools also uses that term "Internal Busses" in their documentations. The popup menu for the Output Selector ➎ Sends Selector ➏ lists that menu item "output". The Input Selector ➍ also lists the menu item "bus", but remember, here it represents an input, feeding all the signals to this input that are routed to the selected bus from other channel strips.